The Mad Dog has been Microsoft Certified since 2000 as a MCSE (Microsoft Certified Systems Engineer), MCSA (Microsoft Certified Systems Administrator) and a MCP (Microsoft Certified Professional). The Microsoft Certified Systems Engineer (MCSE) certification is one of the most widely recognized credentials in the Information Technology industry and shows expertise to design, implement, and administer infrastructures for business solutions based on Microsoft Windows Server platforms, including installing, configuring, and troubleshooting network systems. The Microsoft Certified Systems Administrator (MCSA) certification shows expertise in administering network and systems environments based on the Microsoft Windows operating systems and that the holder has skills to successfully implement, manage and troubleshoot network environments running on Windows server systems. Microsoft Certified Professional (MCP) is a certification that validates IT professional and developer technical expertise through rigorous, industry-proven, and industry-recognized exams. 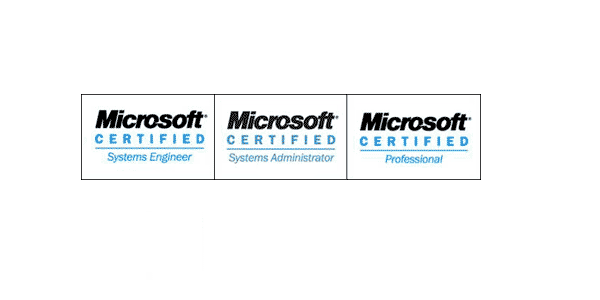 Though all of these certifications may be impressive, they are really just validation of more than 25 years of real world experience designing, implementing, troubleshooting and maintaining networks around world from the middle of the Indian Ocean, Hawaii and Guam, Alaska, from one side of America to the other and all the way to the Middle East.